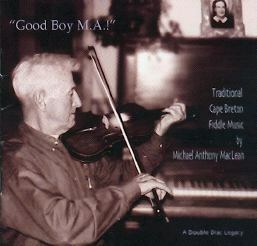 Cape Breton Fiddle Music - Michael Anthony MacLean - Good Boy M.A. Michael Anthony MacLean passed away in 2008 at age 95. Brother of well known recording artists Thesesa Morrison and Joe MacLean, Michael Anthony had a unique style for dance music. A lovingly assembled compilation with extensive notes, these recordings were made from 1955-2003. Michael Anthony was an ear player from the old school. His reperoire is rich and varied because of the wonderful musicians that surrounded him. Six of his siblings played the violin, his brother Joe and sister Theresa both being noted interpretors of Scottish written tradition. He often learned his tunes from memories of live music he had experienced.